Opening reception: Saturday January 19 3-7pm. When the dust settles, a moment of clarity arises. The desert is an artist’s haven where expansive skies avows creativity. The Mojave Desert has become a pilgrimage for artists coming to pay homage to their practice. This inaugural exhibition is a collection of works created by artists who share the commonality of physical transplantation from a concentrated asphalt grid. Landing amongst the Joshua trees, an epoch moment has begun to germinate. MOVING THE MEMORIES, a documentary film I shot and directed for Mil-Tree was selected to screen at the Palm Springs Dance Festival as part of their inaugural film series. The screening is scheduled for March 9th, 2019 with a brief Q&A. I'll be discussing relationships to place, how living in the desert has deepened my commitment to integrating art and life, and what it means to have a migratory observational practice. "Temporal and Corporeal: A Broad Scope of Performance Art"
I am thrilled to have two videos from The Resident series included in the exhibition, Temporal and Corporeal: A Broad Scope of Performance Art, opening at Ohio University next year. Many thanks to the Mojave Desert land Trust for visiting the site of the Archeology/Ground Nest Project this week. 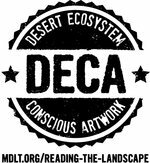 The project was given the Desert Ecosystem Conscious Artwork (DECA) badge to indicate that the artwork was fabricated consciously and that it adheres to their environmental regulations. For more info, visit MLDT and learn about their Reading the Landscape program. For updates on the project, go here. My Mother's Pants. Single-Channel Video. 0:58 seconds. Color. Sound. 1995. The Getty Research Institute has announced the acquisition of the Joanie 4 Jackie archive, a feminist filmmaking project created by Miranda July and previously archived at Bard College. Podcast interview with Greg Swiger at Final Friday. Podcast interview with Greg Swiger over at Final Friday. "Mary Addison Hackett is a Nashville-based artist who works with video and painting, but also social practice and documentary. We had a great conversation about her practice, chair collection, and more."